The company Llicorella Stone Jaume Vila is a family business dedicated to the extraction, processing and placement of high quality natural stone respecting the environment since 1986. The extraction is done in our own quarries located in the municipalities of Aiguafreda and Tagamanent, both in the province of Barcelona (Spain). Our quarries have the concession type "C" and the adequacy of environmental licenses under current law. We distribute nationally and internationally (Andorra, France, Germany ...), both individuals and large companies in the public and private sectors. We specialize in stone Llicorella by walls, cladding walls and gardens, both as placated, and as a subbase material for roads and gravel for soil stabilized with cement. 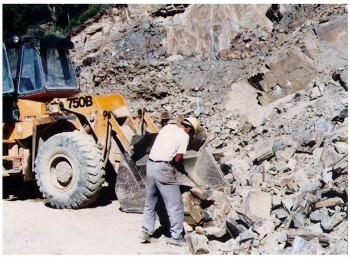 We also serve all kinds of stone from limestone to granite. We are also dedicated to the creation and restoration of forest roads and trails. Llicorella Stone Jame Vila is a founding member of the Catalan Association of Natural Stone and the Catalan Federation of the Stone. Currently belongs to the Arid Guild of Catalonia.